Benn was an MP for 50 years and a cabinet minister under Harold Wilson and James Callaghan. Unlike many of his fellow politicians, his actions matched his words. He was born into an aristocratic family, but early in his career denounced the unfair advantage of inherited rank. Determined to give up his peerage (he would have become Lord Stansgate) he championed legislation – finally passed in 1963 – which allowed him to renounce his title. ‘I am not a reluctant peer,’ he told a challenger. ‘I am a persistent commoner’. Tony Benn was unusual among politicians (and the general public) in that he moved more to the left than to the right as he got older. The more injustice he observed, he said, the more fiercely he felt the call to fight it. In his earlier years the media liked to portray Tony Benn as ‘the most dangerous man in Britain’ but more recently he was seen more as a ‘national treasure’… something he found amusing, telling a Telegraph journalist, ‘I might be kindly and old, but I’m not harmless’. He was a truly inspiring person to know, disciplined and principled, a teetotaller and vegetarian. I remember him best, not speaking – and he was one of the greatest living orators – but listening. He always had time for the many people who approached him, strangers, opponents, comrades, whoever they were; he would give them his undivided attention before answering, often with wit and humour. He made it his mission to encourage others, bolstering their sense of their own power. ‘There are two ways in which people are controlled,’ he used to say. ‘First of all frighten them and then, demoralize them’. 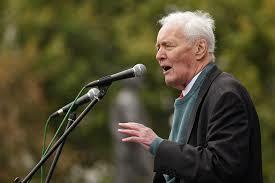 Tony Benn is survived by his four children Hilary, Joshua, Melissa and Stephen. This entry was posted in Journalism and tagged Tony Benn obituary on March 14, 2014 by susandemuth. Although I am not at all political I was aware that he was a good ‘un! He will be missed by many people for his sense of justice and the moral code he displayed.